Guide to everything you need to know about the Cotes du Rhone and its wines. If you’re looking for wines with Southern Rhone charm that are easily affordable for every day drinking, you need to be buying wine from the Cotes du Rhone appellation. Without a doubt, some of the best wine values in the Rhone Valley, if not the entire world come from the Cotes du Rhone. Savvy wine loving consumers looking for early drinking wines with character that won’t break the bank should be taking a serious look at wines from the Cotes du Rhone. It’s reasonable to say that the Cotes du Rhone is in serious competition for the title as the best wine region in the world providing truly sublime character driven wines at fair prices. The red wines can be fruity, sweet, spicy and packed with ripe, red berries. The wines can be sweet, fruity and easy to drink. If you’re a wine lover seeking value and early drinking pleasure in the wines you buy, you must learn about and discover the Cotes du Rhone. More than just value, Cotes du Rhone wines are for the most part, meant to be enjoyed on release. The majority of Cotes du Rhone wine do not require aging, even if a few wines do improve with time in the cellar. Frankly, they are delicious on release, which is a big part of their allure. Cotes du Rhone wines are also easy to pair with a wine variety of foods, which we will cover in detail. Plus, Cotes du Rhone is perfect for visits by casual wine lovers and tourists. It is one of the few wine regions, where tourists can stop in most wineries without an appointment, and still have a great visit and tasting! Overview of Cotes du Rhone Appellation: Cotes du Rhone is a massive wine region. In fact, it’s the second largest appellation in France. Only Bordeaux has more hectares planted with vines. The entire region is about 44,000 hectares with 31,926 hectares under vine. Close to 100 Million dollars worth of wine is is produced here every year. England is the biggest buyer of Cotes du Rhone wines, followed by France. Not only is Cotes du Rhone one of the largest appellations in all of France, it’s also one of the oldest. The ancient Romans were the first people to cultivate the land for grape vines. The region began earning fame by 1737, when by Royal Decree it was declared that all wines barrels from the region must be branded with the initials of the area, CDR, to ensure quality. The Cotes du Rhone was officially declared an AOC appellation in 1937. The boundaries of the appellation has increased substantially since it was originally declared. Cotes du Rhone Soil, Terroir and Grapes: The Cotes du Rhone is not a modern creation. The region was originally known as the Coste du Rhone. That changed at some point during the 1800’s. The massive region as you might expect features a myriad of terroirs and soil types that range from rocky hillsides to stony vineyards or land with sand, clay and various rocks, stones and pebbles. The Cotes du Rhone is planted for the production of red wine, white wine, rose’ sparkling wine and even sweet dessert wine. Simply put, 89% of all wines are red, 7% is rose’ and 4% of the production is white wine. While there are 21 different allowable wine grapes able to be planted in the Cotes du Rhone, the dominant red wine grape is Grenache followed by Syrah, Mourvedre, Cinsault and Carignan. For the production of white wine, the most important grape varietal is Grenache Blanc, followed by Clairette, Bourboulenc, Roussanne, Marsanne and Viognier. AOC law for Cotes du Rhone states that all red wines, including rose’ must use no less than 40% Grenache in their blend. Things are a bit easier for white wines with the requirement being that at least 80% of the blend come from Grenache Blanc, Clairette, Roussanne, Marsanne, Bourboulenc and Viognier. Cotes du Rhone and Cotes du Rhone Villages While the Cotes du Rhone has 5 appellations in total, the easiest way to look at the region is to divide it into two levels of quality, Cotes du Rhone Villages, which is a higher level of classification and Cotes du Rhone, which is less prestigious, as its terroir is not at the same level as the wines from Cotes du Rhone Villages. To produce wine with either designation, the vineyards must be located in any of the following 18 villages that make up the Cotes du Rhone appellation: Bagnols-sur-Ceze, Chusclan, Laudun, Massif d’Uchaux, Plan de Dieu, Puymeras, Roaix, Rochegude, Rousset-les-Vignes, Sablet, Saint-Gervais, Saint-Maurice-sur-Eygues, Saint-Pantaleon-les-Vignes, Valreas, Visan and Seguret, which is the largest of the villages. The first vintage bearing the Cotes du Rhone Villages designation was 1953. From those 18 villages, there are a total of 171 communes that make up the region. To be a Cotes du Rhone Villages wine, the wine can come from 95 different communes. Generally speaking, Cotes du Rhone appellation laws do not allow for village names to be displayed. However, it is permitted to list the commune, if the commune is one of the 18 permitted communes in the Cotes du Rhone appellation. The wines bearing the Cotes du Rhone Villages designation are generally speaking, the best wines from the appellation. But not always, as Coudoulet from Beaucastel and Fonsalette from the owner of the famous Chateau Rayas are both as good as many wines from Chateauneuf du Pape! 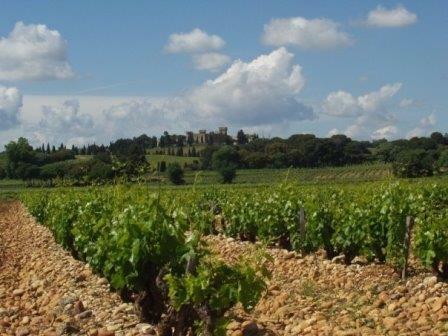 If you’re seeking wines from the Cotes du Rhone Villages, it’s best to look for wines from the Vaucluse department. The Vaucluse department in southeast France takes its name from a local spring, the Fontaine-de-Vaucluse. The Vaucluse is a massive valley with mountains and the Rhone river to the west, with the Durance river to its south. The best vineyards in the large region are in the Drome department. There are several Co-operatives in the Cotes du Rhone, but you should focus on seeking wines from the better producers, as most of these wines are quite often well priced. 3 new appellations were added to the Cotes du Rhone Villages in 2017, Sainte-Cecile, Suze-la-Rousse and Vaison la Romain. Each of the three regions has their own, unique identity. All 3 of the new appellations are only allowed to produce red wine, to be allowed to use their appellation status on their labels. The majority of wine from the Cotes du Rhone Villages Vaison is made in one of 6 local cooperatives. Close to 15 different producers also make wine in the appellation. The Cotes du Rhone Villages Sainte-Cecile appellation also has close to 15 different wineries in the region. The remaining growers sell their harvest to 3 different cooperatives. The Cotes du Rhone Villages Suze-la-Rousse has over 20 different growers making wine in the appellation. The remainder of the grapes are used by 2 local cooperatives. The Best Cotes du Rhone Wines Many producers from Chateauneuf du Pape own vines in the appellation. It’s easy to see why because there are parts of the Cotes du Rhone that have almost identical terroirs found in Chateauneuf du Pape. In fact, there are vineyards in the Cotes du Rhone that are either just across the road from Chateauneuf or only a single row of vines away. The Cotes du Rhone is the largest appellation in the Southern Rhone Valley. Close to half of all the wines produced in the area are from this appellation. The region produces red wine, white wine and rose’ wine. While there are countless good producers in Cotes du Rhone, from the top of our short list, look for wines from: Janasse, Rayas, Vidal Fleury, Chapoutier, Beaucastel, Clos du Caillou, Roche, Vieille Julienne, Les Cailloux, Michel Gassier, Grand Veneur, Mas de Boislauzon, Clos des Papes, Vieux Telegraph, Pierre Usseglio, Feraud-Brunel, Daniel et Denis Alary, Calendal, de Mourchon, les Aphillanthes, Les Halos de Jupiter, Santa Duc, Xavier Vins, Giraud, Beaurenard, des Tours, La Bastide Saint Dominique, and Perrin et Fils. While those are the best producers in the Cotes du Rhone, keep in mind, there are numerous producers making delicious, affordable and easy to find wines from the Cotes du Rhone appellation today. Wine Fraud in Cotes du Rhone Even though much of the appellation is value priced, the wines are not impervious to fraud. Between 2013 and 2016, as many as 64 million bottles of wine were labeled and sold as Cotes du Rhone, and Cotes d Rhone Villages, however, the origin of grapes is actually from outside the appellation. When added up, that is slightly more than the 15% of the wines produced in those vintages! The wines from the estates that produce and bottle their own wine were not affected. The wines at the lower end were affected. Cotes du Rhone wine and food pairings. Cotes du Rhone wines are extremely food friendly and can be easy to match with a wide variety of foods. Cotes du Rhone red wines can be paired with any type of meat, grilled, roasted, braised or stewed. They are also perfect paired with a wide variety of soft and hard cheese. White Cotes du Rhone wines are easily paired with any type of fish, shellfish and even sushi. Cotes du Rhone white and red wines are perfect when served with a variety of different hard and soft cheeses. The Best Vintages of Cotes du Rhone are: 2016, 2015, 2012, 2010, 2009, 2007, 2005, 2001, 2000 and 1998. Because most Cotes du Rhone wines are vinified for early consumption, it’s best to seek them out during their first 3 to 5 years of life. While some wines, especially the red wines produced in the best vineyards in the top years can age longer, perhaps as along as 15 to 20 years, the majority of Cotes du Rhone wines need to be tasted in their fresh youth.